This tale is told in the way almost every novel from this genre is told - contemporary time, flashback and a snippet from the killer every 2 or 3 chapters. So far, so far trope. However, as I became absorbed in the book - and believe me absorbed is the right word - I soon realised that I was in the hands of a master storyteller. Although there is an element of procedural about it the Gardai are definitely only a minor part of the book and everything really does revolve around Alison. You see Alison was dating the Canal Killer, Will Hurley, when he was arrested for the murder of her best friend since school days, Liz. The book takes us through how these events have marred Alison's life, leaving her unable to trust her own judgement or let people get close to her. It is a secret that she hugs to herself and sets her slightly apart from the group of Ex-Pats she socialises with in her new life in Den Hag. We move seamlessly between present day Dublin and Alison's reminiscences of her youth. When the killer strikes again, 10 years later, Will Hurley has information for the police but will only speak to Alison. Feeling slightly pressured when they doorstep her on a hungover morning at her home she finally agrees to return to Dublin and speak to Will. As she lands on home soil all the memories come rushing back. I loved the character of Alison even if I wanted to shake her younger self for allowing Liz to trample all over her. She is a strikingly normal person and the character manages to remain true to herself throughout the book - no sudden instance of her becoming Miss Marple - even as the pieces of the jigsaw start to slot in to place she makes no leap of understanding to get to the identity of the killer. She finds out when we do, with no needless red herrings thrown in for the sake of confusing the reader. This is a tightly written novel and you don't so much read it an inhale the words off the page. The pacing is perfectly executed with just enough twists to keep you guessing and enough detail about the streets of Dublin to make you boot up a mapping application to see the streets this is set in. Whilst some locations are fictional some are not and I got to walk the virtual streets alongside her, calling in for coffee at the picket fenced cafe. I sort of saw the big twist at the end of the book coming but it still managed to somehow shock me. What happens in the rest of Alison's life we will never know but she has renewed her relationship with her mother, her best friend from the ex-pat community, Sal, knows her dark past and is providing support, there is a whiff of romance with Garda Officer Malone; hopefully everything will work out for her - she deserves it. This is a stand out book in a busy genre and only the authors second; which makes her achievements here all the more incredible. 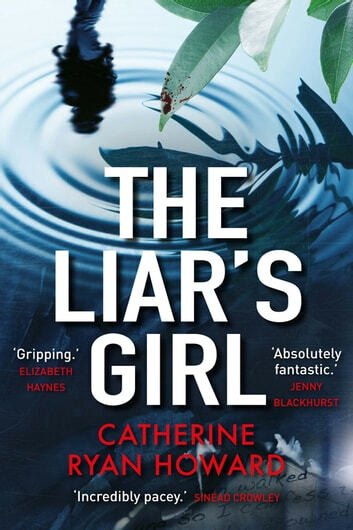 It really did renew my faith in psychological thrillers just as I was beginning to think I should give up reading them because so many had disappointed on so many levels. I RECEIVED A FREE COPY OF THIS BOOK FROM READERS FIRST IN EXCHANGE FOR AN HONEST REVIEW. Well written, no need for the twist at the end. Fantastic characters. Wow what a gripping read. Thoroughly enjoyed the book in a gruesome sort of way. Fantastic twists and turns.